‘Abd Manāf al-Mughirah ibn Quṣai (Arabic: عبد مناف المغيرة بن قصي‎) was a Quraishi and great-great-grandfather of Islamic prophet Muhammad. 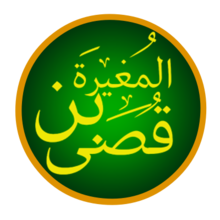 His father was Quṣai ibn Kilāb. Abd Manaf was already honoured in his father's lifetime however Qusai preferred his first-born 'Abd ad-Dar and invested him with all his rights, powers, and transferred the ownership of the House of Assembly shortly before his death. After Quṣayy's death, Abd Manaf contested this inheritance, He was supported by their nephew Asad, their uncle Zuhrah ibn Kilab, their father's uncle Taym ibn Murrah (of Banu Taym), and al-Harith ibn Fihr, while 'Abd ad-Dar was supported by their cousins Makhzum, Sahm, Jumah, their uncle Adi and their families. The effects of this conflict continued among their descendants, especially under Abd Manaf's son Hashim and affected the internal history of Mecca right up to Muhammad's time. Raytah of Ta'if, and Waqida bint Amr. Persian kings etc. 1. Yezdegerd. Name of 3 Sasanid kings. 2. Abd Manaf of Qurayshi tribe, Muhammad's great-grandfather. 3. Hormoz. Name of 5 Sasanid kings. The grave of ‘Abdu Manāf can be found in Jannatul Mualla cemetery, in Mecca. ^ Lings, Martin (1983). Muhammad: His Life Based on the Earliest Sources. George Allen & Unwin. pp. 6–7. ISBN 0946621330. ^ Armstrong, Karen (2001). Muhammad: A Biography of the Prophet. Phoenix. p. 66. ISBN 0946621330.